If you want to start a new blog. You should know about the blogging niche. Niche has reflected the specificity of the blog topic. If you are choosing the topic of the blog like “Anything”, that will not be good for the health of the site. You have to specify and clear about the name of the blog before starting it. Choosing the ideal niche to strengthen your blog topic to improve importance worldwide. The tips, explanation, and clarification are defined below. The best way to choose the blogging niche is to first you analysis yourself that which topic is familiar to you. That means your knowledge level and interest should be important to finalize the topic. Interest level is mandatory because you will be provided the solution to the readers. They will ask the question after reading the blog content and your answer should be satisfactory. The basic concept will be worked behind that readers assure that he is on the right way and content publisher is master of the subject. So, it is your responsibility to provide the solution, because your reader does not move to other sites to get the answer. Your presence and an immediate reply will impress the readers and will confirm the re-visit. Actually, it is very difficult to choose the niche. You can resolve this issue to use your mind. As you know that blog niche word form from the local level, if you reside in any region of India then get the words, which use locally but not in all over the world. Similarly, the number of words are using worldwide in the same format as blogging, blog, health etc. Now it is upon you to use the blog title on the national level or International level. Basically, the blogger uses the word, which is famous worldwide. 1. What is your need? 2. What you want to ask? 3. What is the current topic? 4. How you resolve your issues? 5. Which subject and field attract you more? 6. Which problem did you face and how resolved? 7. What is the best attractive topic and increase your interest to know more? 8. What are your hobbies, likes, discussion points, favorite? These are some example, which is very helpful to understand the “niche”. It should be predefined. You should be careful about the blog USP. The full form of USP is “Unique Selling Proposition”. The big number of blogs are available worldwide but some are doing best to attract the readers through the title and content and some fails. Readers follow only those blog, which has the capacity to answer the question and perfect in his field. For example - A tech blog serve the content, which is relevant for the blog and based on technology. Visitors search the content from the search engine and use the word, which is very common at the local level or first came in his mind. That word is used locally on the mass scale and you can say that word is “niche” for your blog. The big benefit to using a niche for the blog is to increase traffic on site. Another way to choose the niche for the blog is to search the topic, which you read most. Generally, you see that some topic is always a part of the discussion in the group. That is the best way to choose the subject for the blog niche. The discussion topic can be on Money Making, Blogging, Earning, Web Designing, Economical Condition of Country, Travelling etc. You have to choose the best one and start writing on that. Be careful during the selection of the topic for the subject. Keyword density check and research will be required to finalize it. Try to avoid tough word for the blog topic, generally, the tough word does not use by readers to search the content, they use the general and talky words. Now, the big discussion point is ‘What is the best niche for the blog’. Below are the words, which are the best ‘niche’ as per the blogger experience. Insurance, Health, Computer, Technology, Travel, Personal Development, Web Development, SEO, Link Building, Gaming, Social Media, News, Friendship, Food, Love, Property, are the best. The number of other niches are available, just you have to select one. First of all, you have to select your topic and search the tools to collect the niche word and sentences for the blog topic. If you search the topic to sell and marketing the product, the best option to go to Amazon, eBay, Shopclues site. See the product category option, which words use to sell the product. That will be helpful to understand to choose the marketing niche. Similarly use for travel, health etc. The daily newspaper is also the best resource to collect niche words on the regional level. 1. Google Keyword Planner - This is the best tools provided by Google for you in free. This tool is part of Google Adwords. You have to place the word in search option and tools provide the keyword strength and CPC rate. 2. Google Trends - This is another free tool for you. Very simple interface and easy to use. Place your words in search option and get the percentage of search. That will reflect the present strength and popularity of the keyword. 3. See The Ads On Google In Search Engine - Google is using a top searchable niche keyword for Google Ads. You can get the idea of the most searchable keyword. You have to search the keyword, which comes to your mind instantly, Google will reflect similar words for you which are popular worldwide. The final conclusion is that, try to research on blog niche. Words selection is important. You can search the words or sentence strength on Google Trends and take the decision, is it shoot for your blog. If you did not take care to use the niche for your blog title. You will waste your time and money. 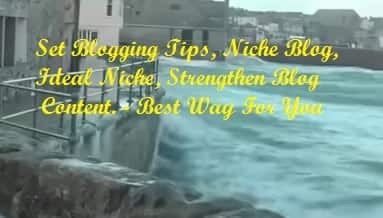 I provide the details about the niche for the blog as I fill during writing the content and title. Please share the content if you like it.